The server microprocessors are equipped with multiple processors which enhances the processing capability of the machine. Additionally, the storage capacity is also enhanced with the insertion of the multiple disks. The server microprocessor market is anticipated to record a CAGR of 2.5% over the forecast period. 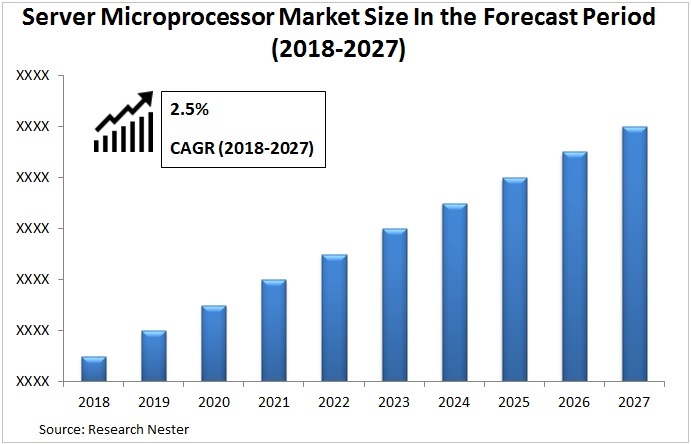 It is expected to attain a total value of the USD 17 billion by 2027.The global server microprocessor market is observing vibrant growth on the account of expansion of the technology which includes IoT (Internet of things), big data and artificial intelligence. Additionally, increasing penetration of the internet across the globe leads to the expansion of the data centers. Thus, it is anticipated to boost the growth of the overall market during the forecast period. The increasing adoption of the cloud based services across the various organizations in order to increase the operational efficiency is anticipated to drive the overall server microprocessor market during the forecast period. The growing number of the data center across the globe on the account of increasing penetration of internet is anticipated to be the major growth driver for the overall market during the forecast period. Additionally, the increasing penetration of the social networking sites is anticipated to further propel the growth of the data centers. This in turn is expected to boost the growth of the overall server microprocessor market. The high cost associated with the software is anticipated to restrain the growth of the overall market during the forecast period. On the basis of regional analysis, global server microprocessor market is segmented into five major regions including North America, Europe, Asia Pacific, Latin America and Middle East & Africa region. North America region is anticipated to generate the highest revenue during the forecast period. This is attributed to the highly developed industrial infrastructure coupled with increasing number of large scale enterprises in the region. Additionally the presence of the enhanced data centers is anticipated to further propel the growth of the overall server microprocessor market. Asia-Pacific is expected to be the fastest developing region for the overall server microprocessor market. The increasing industrialization in the region leads to increase in the various enterprises. Additionally, the increasing adoption of the cloud based services such as IoT and big data especially by small and medium scale industries is anticipated to further propel the growth of the server microprocessor market.